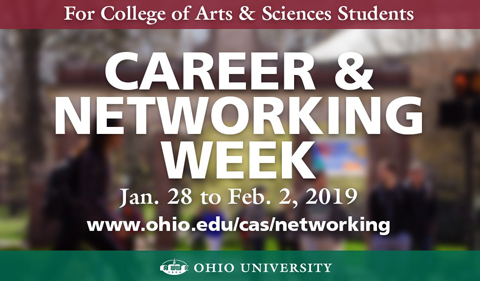 College of Arts & Sciences students, alumni, faculty and staff are invited to the third annual College of Arts & Sciences Career & Networking Week, Jan. 28 to Feb. 2, 2019. A highlight is Alumni-Student Networking Day on Thursday, Jan. 31, 2019, with an Alumni and Student Networking Reception that brings together hundreds of alumni and students majoring in the humanities, social sciences and natural sciences. Discover the features offered through LinkedIn—one of the best networking tools—including how to navigate the Alumni Networking Tool. Bring a laptop or tablet to this interactive workshop. Free LinkedIn photos will be available! Learn how to set-up your profile and utilize Handshake to connect with employers seeking Bobcats through job and internship postings, on-campus interviews, career events, and more. Take advantage of a 10-minute drop-in session to review your resume with Assistant Director Kacey Schaum, who specializes in coaching Arts & Sciences majors. No appointment needed. Dig into the power of building your brand and your network—and discover how this enhances your career trajectory. Learn how to develop new skills that, deployed over time, will create lifelong habits for a successful career. Hear from a panel of employers and Ohio University alumni. Light refreshments and drinks will be served. Panelists include Rebecca Melick ’94, Cynthia Calhoun ’88, Tim Law Sr. ’94, and Juan Thomassie. Thursday, Jan. 31, 2019—Alumni Networking Day! The Arts & Sciences networking night brings alumni and students together for a career development and networking lab with how-to instruction for one-to-one student and alumni networking. 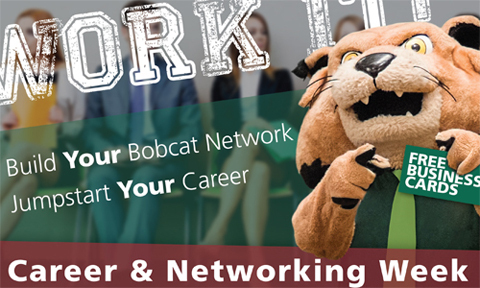 Students will receive business cards, engage in the “Art and Science of Networking,” and build their Bobcat network. Read about Aaron Schwarz ’11. Enhance your leadership development with a certificate! The Saturday Series is a unique opportunity for Ohio University students to complete all of the workshop requirements for the Professional Leadership Certificate and the 21st Century Leadership Certificate in one Saturday.